At this point, with the exception of the rear fender and the attached turn signal and brake light assembly, I have everything installed in the frame that the wiring harness connects to. Here the ones specific to the /5 series airheads. Here is the list of new parts I installed. The wiring harness is in need of a couple minor repairs. The outer sheath where the main harness separates into the rear frame harness, rear brake switch wires and the transmission neutral switch and engine oil pressure switch wires has cracked exposing the wiring underneath it. I used electrical tape and wrapped over the sheath with two layers wrapped at 45 degrees to each other. I added small tie wraps on either end to keep the ends of the tape from pulling loose over time. The connector was badly corroded after 40 years and needs to be replaced. This is a short lead that connects to the (+) terminal on the battery. So I used my Dremel tool with a cutting disk to cut through the tabs that were bent over the wire and then carefully used a small screw driver blade to get the wires separated from the lug.I used a new lug and some shrink wrap tubing to make the repair. I crimped and soldered the wire into the new lug and shrunk the tubing over the lug. I also used a small piece of shrink wrap over the cracked outer sheath where this wire separates from the main wiring harness. Here’s the completed repair. You can see the new lug on one end and the shrink wrap repair to the cracked sheath on the other. I already installed the rear brake light switch when I installed the swing arm and rear shocks. And, the front brake light switch was installed in the right control perch when I installed and adjusted the front brakes. The other parts that go on the frame are the starter relay, voltage regulator, horn and ignition coils. I attach the starter relay to the left side of the main frame tube and the voltage regulator to the right side using the Allen head bolts into the tapped holes in the brackets. The voltage regulator on the right side connects to the plug coming from the engine wiring harness as shown above. The starter relay connects to wires from the engine wiring harness and from the headlight shell. I keep a diagram of what wires go where when I removed the starter relay. I updated the diagram with the numbers of the terminals and show then in ( ) while [Front] and [Back] indicate which cable the wire comes from. The wires from the engine wiring harness connect to the terminals on the back side of the starter relay (next to the main frame tube). Here is where they go on the relay with the backside against my thumb. I’ll connect he headlight shell wires after I install the main wiring harness. The coils also mount to brackets on the main frame tube using Allen head bolts and circular straps. Before I mount the coils, I connect the terminals so the coils are in series. 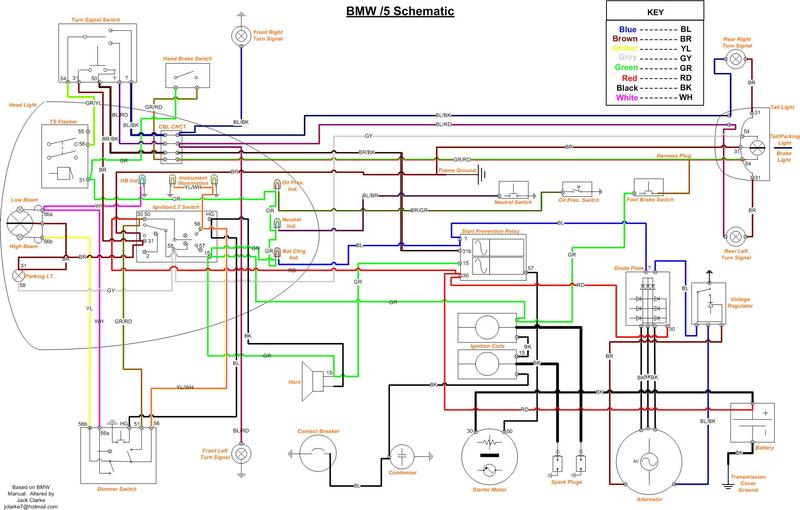 BMW uses 6 volt coils, one for each spark plug, and wires them in series so they draw 12 volts. Both plugs fire at the same time. I connect the (-) terminal on one coil to the (+) terminal on the other. If you look closely at the picture you can see the (+) and (-) markings on the black top cover of each coil. I mount the straps loosely to the frame with one Allen bolt so I can easily slip the coils into the brackets and then tighten up the Allen bolts to secure them. I orient the coils so the black jumper wire between them is at the top with the empty two prong terminals at the bottom. There is a picture of this later on. The three straps mount on the mounting bracket underneath the steering head. The straps are bolted to the bracket, which has a nut welded to it, using the 13 mm bolt and the thin nut acting as a lock nut. The horn I have has the chrome grill that is oriented so the connecting terminals on the back (which you can’t see in this picture) are at the 10:00 position as viewed from the front of the bike. The rubber wire loom goes on the smaller tube beneath the main frame tube and has a number of holes for routing cables and wires along the frame. The original one was rotted so I installed a new one. The large rectangular hole that’s open at the top fits around the main frame tube while the smaller hole that’s closed at the bottom fits around the engine wiring harness and holds it in place. I slide it to the front up against the starter relay and then pushed one of the upper ears under the main frame tube. Here is the front headlight mounting hardware. The rubber gaskets surround the chrome mounting bolts that go through the holes in the headlight ears and the bolt head pushes against the chrome caps. The rubber gaskets have a raised section on one side that fits into the slot in the headlight ears and the round tube for the headlight bolt fits between the two gaskets. The chrome bolt goes through the rubber tube and threads into a nut inside the headlight shell. I had my wife hold the shell for me as I juggled the three rubber gaskets and the chrome nut so I wouldn’t drop the headlight shell. The front reflector mounts on the headlight bracket. It has a shaped rubber gasket with a locating rubber pin on the back that fits into the round hole next to the slot for the reflector bolt. The reflector bolt has a large flat washer and locking nut to hold it to the headlight ear. NOTE: If I did this again, I’d mount the reflectors before I mount the headlight as it is be easier to tighten the lock nut without the headlight shell in the way. I’m not using the front turn signal wires as I will be using the Windjammer fairing wiring harness to power the turn signals that are mounted on the Windjammer. I loop them on the Windjammer cable and secure with tie wraps to keep them save and out of the way. There are several cables coming out of the headlight shell. Two of them have the switch assemblies that mount in the control perches on the handle bars. There is a small pair of wires that go to the turn signals (which I’m not using and didn’t route through the headlight ears) and the large main wiring harness. Here is the routing of the left side switch assembly cable and installation in the left control perch. Here is the routing of the horn branch next to the steering head. It goes under the small diameter brace tube over to the right side to attach to the terminals on the horn. The main wiring harness includes a number of shorter branches and all of them have a mind of their own. To get them to do my bidding, I used electrical tape to bundle the shorter branches to the main one so I end with with a single cable that tapers down until it ends in the branch that goes to the rear turn signals and tail light. Then I thread the cable from the front of the bike so it goes along the main frame tube between the brackets for the starter relay and voltage regulator. The cable goes through the rectangular hole at the top of the rubber wiring loom next to the main frame tube and continues to where the battery box is. There are two short branches near the steering head, one has two wires for the horn and the other has the wires that connect to the starter relay. I connect the horn wires routing the cable to the right side of the main frame tube. I disconnect the starter relay and route the headlight cable behind the bracket and then connect the wires to the lugs on the relay and then reattach the relay to the bracket. I attach the right control perch switch to the perch using the screw and then attach the switch to the housing using the smaller screws on the side of the housing. I add the new brake light switch rubber boot to the short brake light branch and then mount the wires inside the terminals of the front brake light switch. The main wiring harness divides into separate branch cables going to the rear brake light switch, the transmission neutral and oil pressure switches and the branch that routes through the rear sub-frame to the tail light and rear turn signals. I use a piece of wire and thread it from the hole at the back of the rear sub-frame to the hole on the other side of the chrome grab rail. I wrap the end of the wire next to the grab rail around the branch cable going to the tail light and turn signals and then cover this with electrical tape. Then I pull the branch cable through the rear sub-frame tube using the end of the wire at the back of the sub-frame while pushing it from the front near the grab rail. The last picture below shows the pull wire wrapped with electrical tape. I detach the pull wire and adjust the rear frame branch so the other end where it separates from the main wiring harness is positioned to allow the other branches to be routed along the back of the frame. The places the branch junction near the grap rail and the rear down tube of the frame as shown below. The rear brake light branches off the transmission neutral and oil pressure branch near the bottom of the battery box. I route the rear brake light switch under the battery box bracket next to the lower horizontal brace tube over to the rear brake light switch inside the right exhaust mount bracket. This picture shows the wire ties I used to secure it, but I didn’t add them until I had the wires connected to the rear brake light switch. The rear brake light switch has a rubber cover with two small holes for the wires. I pushed them through the holes and then connected the wires to the screw terminals on the brake light switch. Then I made sure the wires were routed so there is some slack by the rear brake light switch and then added the tie wraps to secure this branch to the horizontal tube under the battery bracket as shown in an earlier picture. This branch routes through the gap between the main frame rear down tube and the gusset that reinforces the swing arm tube. This branch routes along the bottom of the lower main frame tube where it splits into the transmission neutral wire and the oil pressure sender wire. I route the oil pressure wire so it passes through the hole in the bottom of the transmission housing up through the brass button and through the set screw hole on the back of the transmission. The set screw has a very small slot in it requiring a thin blade screw driver to tighten it. The oil pressure sender wire routes along the lower main frame tube and connects to the tab on the sender. I tie wrap the oil sender wire on the inside of the frame tube to protect it from being snagged by a foot when shifting. The new cable to the starter motor solenoid connects to the large screw terminal on the starter solenoid. The cable passes through a slot in the engine case and a rubber grommet to seal the cable to the case and the aluminum starter motor cover (not shown). I bought a separate rubber grommet (some cables already include it). The top of my grommet was solid rubber so I cut an X in it and then pushed the starter cable through as shown below. I connect the cable to the screw terminal. The cable is thick and stiff and didn’t want to go on the terminal which has a boss that holds the cable in place. I ended up bending the tab about 30 degrees in my vice to make it easier to route. I also bent the cable by hand with a sharp turn where it has to go up through the engine case. The I route the cable to the right side of the rubber wiring loom into the large hole at the top. The holes in the wiring loom are split and you can easily slide a cable into a hole by spreading one leg of the loom to open the split and slide the cable in. Then I loosen the coil brackets and pass the cable between them and angle it toward the left side of battery where the (+) terminal is bending it into an S-curve. I add a tie wrap to hold the cable against the side of the large backbone frame tube. The (+) battery terminal attaches to both the starter motor solenoid cable and the smaller diameter starter relay wire that breaks out of the main wiring harness near the grab rail. The ground cable has a 90 degree bend in one lug and that attaches to the (-) battery terminal. The other end of the ground cable is a flat lug that connects to the transmission breather bolt that also holds the tachometer cable. I route the ground cable with a slight S-curve so it tucks between the vertical frame tube and the battery box. CAUTION: Do not over tighten the transmission breather bolt or you will strip the threads. I will test the turn signal and brake lights when I attach them. DANGER: If your engine is disassembled as mine is DO NOT HIT THE STARTER BUTTON when the starter motor is attached to the flywheel. I unbolted the starter motor so it was clear of the flywheel, grounded it and then pressed the starter button and the motor spun. Then I disconnected the (+) and (-) cables from the battery so something inadvertent doesn’t happen as there are still exposed wires. Here’s what the project looks like at this point. 2019-02-06 Added Electrical System Resources section. Hello and thanks for the detailed pics and text about wire harness routing. They have been very helpful thus far. I am beginning to upgrade my 1970 SWB R75/5 wiring. The earlier owner had run additional/extra wires for some reason, probably to fix gremlins as they occurred. Although this has ‘worked’ for the 4 years I have ridden and learned how to wrench on it I now realize it may potentially dangerous and am ready to install a /3 harness. I don’t yet know what the difficulties will be, but I am looking forward to proper wiring (and fuses) for the next riding season. Thanks for coming by and reading some of the write-ups I’ve posted. The wiring is always mysterious to me until I take it apart and take pictures of what went where. Bob Fleischer (aka, “Snowbum”) has a lot of wiring diagrams on his site and those may be helpful to you. Best of luck on the “nervous system” upgrade on your R75/5. I want to add my thanks for this fantastic profile, including the volume of photos. I’m working through a similar wiring project right now on a ’71 75/5, and this information–particularly how it is presented–is exceptionally helpful. Thanks for the very kind words. I’m glad this material is helping you on your project. Best of success on your 71 R75/5 project. Just wanted to say thanks for this whole series of posts. I’ve got a 1970 R75/5 that came as a basket case and this series has been hugely helpful for things like cable routing and the exact positions of parts relative to each other. Thanks for dropping by and the kind words. I figured folks would appreciate some detailed photos showing cable and wiring routes as well as what goes where. Best of success in getting yoru R75/5 back on the road. Thanks for some useful information and photos on your project ! Very helpful ! I have a 1970 R60/5 and when out yesterday for a run found out that when removing the key to stop the bike (not to easy on the other side of the screen I may add) the warning lights all went off but the engine kept running. I stalled it then started it again OK but NO stop on removing the key. Today it all works OK again. What I would like to do as a useful alternative is wire in a stop switch button onto the bars as an alternative way of stopping it. Any ideas how to do this please ? I’m glad this material is useful to you. As a kill switch was added on the /6 series, you can see where that switch connects to the wiring on this diagram from Bob Fleischer’s site (aka, Snowbum). Based on what you are telling me, when you remove the key (aka, the “nail”), the switch isn’t opening to stop the engine. My quick glance at the /5 wiring diagram shows a green wire going to the low voltage side of the coils and another to the indicator lights. When the nail is removed, I assume this opens the connections to those green wires, except it isn’t opening the connection to the coil so the engine keeps running. If maybe that some cleaning with electrical contact cleaner would get things right again. And, if you want to get good advice on how to do this, you ought to join the micapeak airhead forum where you can post any technial questions you have and you will get very informed input. What terminals do I use for the flasher relay on the base for a 70′ /5? Also is there a less expensive flasher relay I can use instead of the hella? Bob Fleisher has a site with a lot of detailed information. This article should help you. 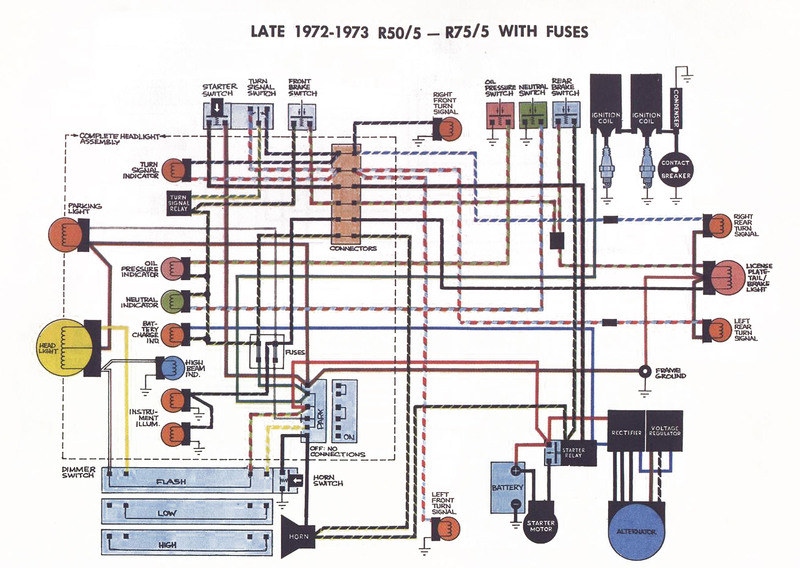 I find the wiring diagram in the Haynes manual is very helpful to show what wires go where. And, a search of google images provides some nice ones, such as this one from the 5 United /5 owners group for 72 on. And this one on Duane Auscherman’s site is very nicely documented. Thank you very much. I should be good to go! Hi from England. Been following your excellent strip and rebuild notes which, in several cases, have saved me many hours and mistakes. Have one minor comment I.e. On my bike the starter relay is on the left of the frame and the regulator is on the right, your photos appear to show the same whereas your notation is opposite. Thank you for finding this mistake. I fixed the picture captions so they match the text. It’s gratifying to know this material helped you on your project. Best of success. Just a comment after suffering ‘Sods Law’. I assembled the front forks following your excellent notes. All went really well until I attempted to fit the indicators on the brackets, which I had re-chromed, I then found that they are handed as the indicators would only fit onto the brackets facing backwards. I’ve checked all the diagrams on the various sites and there is no indication that they are handed and they just give the one part number. Hey ho all off again tomorrow and switch the brackets. Don’t you just love it when what you thought was straight forward turns out to be not the case. 🙂 ‘Tis the joy of overcoming the cussedness of inanimate objects that keeps us working on these bikes, isn’t it? Yes you’re right but still the best bikes ever made. Reversed the indicator brackets this morning now trying to work out the wiring in the headlamp. Is there a fools guide to re-wiring? I made notes and sketches but can’t follow my diagrams and the new harness, direct from BMW is on the face of it identical but the cables exit the loom slightly differently. Any advice would be most appreciated. The Haynes manual does show the color of the wires in the diagram (as in the line color matches the wire color) and that makes it easier to keep things straight. I would also use an ohm meter connected to each end of any wires you aren’t sure of. If the meter shows no resistance, then you know both ends are on the same wire. I’d start making connections for the clear and less complicated connections first to whittle down what’s more complicated. This eliminates the number of choices for what the wire connects to. In general, all wires with the same color code connect. If there are instances where that is not the case, the wiring diagram in the Haynes manual will show it.